A report issued by NASA’s Independent Review Board (IRB) which was embraced by the space agency itself, unanimously recommended that the mission should be allowed to progress. Citing scientific reasons to not cancel the project, representatives continued defending the JWST despite it having becoming a money pit and a black eye for the U.S. space agency – as well as a target for cancellation. Known initially as the Next Generation Space Telescope, the estimated costs for the mission were placed at around $500 million, once Northrop Grumman became the prime contractor, the mission’s cost increased to $825 million. If it launches on the most-recently issued date – the telescope will have cost some $9.6 billion. A post made on Twitter by Grant Trembly, an astrophysicist with the Harvard Smithsonian Center for Astrophysics provided a graph detailing the program’s delays and increasing costs (left). In 2010, the science journal, Nature described the JWST as the “telescope that ate astronomy.” On July 6, 2011, the United States House of Representatives’ appropriations committee on Commerce, Justice, and Science made an effort to cancel the JWST. At that time, $3 billion had already been spent and some 75 percent of the spacecraft’s hardware had been produced. The committee noted that the project was “billions of dollars over budget and plagued by poor management.” The JWST was allowed to continue with a budget capped at $8 billion something that NASA has admitted will be breached. Despite the long delays and ballooning costs, NASA Public Affairs Officer, Dwayne Brown, opened Wednesday’s teleconference with the statement that “Webb is worth the wait!” This was a recurring theme throughout the June 27 teleconference. Human errors, lack of experience, complexity, excessive optimism were cited as examples as to why the spacecraft has been repeatedly delayed. In the last decade alone, the mission has been slated to launch in 2018 (this date was given in 2011 and the cost of that delay alone is estimated at costing $1 billion), 2020 and now 2121. 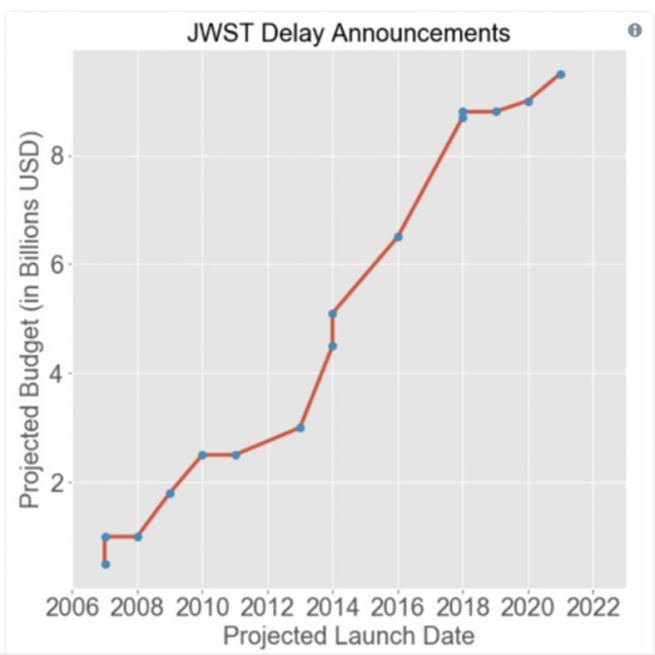 In fact, the JWST has seen no fewer than 11 launch delays. NASA representatives told SpaceFlight Insider that, despite the 25 years since the program was conceived, that the loss of trained personnel was not an issue. Some of the issues caused by human error included the use of incorrect solvent in the cleaning of propulsion valves, test wire mistakes that caused excessive voltage to be applied to transducers and fasteners for the Sunshield being improperly installed. It was noted by the Associated Press’ Marcia Dunn that during one particular test, the one involving the fasteners that some 70 pieces were lost – with two of them still remaining within the telescope. It was mentioned during Wednesday’s teleconference that these issues could have been avoided with relatively simple fixes and caused a delay of about one and a half years and some $600 million. NASA has now not only breached the cost cap – but the schedule as well. Congress will now have to authorize this increase during the next cycle of appropriations. NASA has completed a replan that determined a total life-cycle cost to support the March 2021 launch date of about $9.66 billion; this cost includes integration & test, launch, commissioning, and five years of operations and science costs. The development cost estimate (the cost through commissioning) of $8 billion would increase to $8.8 billion. While other NASA initiatives have been cancelled after billions of dollars had already been spent on them (such as the Constellation and ARM programs), the agency does not appear to be cutting its losses on JWST anytime soon. This amount does not include the expense paid by NASA’s partners on the project, the European and Canadian Space Agencies. Throw every Northrop Senior leader in prison for treason, cut off every subcontract, and get some people involved who care about success instead of sucking down 14years of cost overruns. The state of US contracts is absurd….and sad. Northrop said they could do it for $500M, hold them to it. Take back the $9B and demand a telescope. Lock them out of bidding on other contracts until the goods are delivered.